Our soon-to-be daughter (who will be 1/2 Navajo, 1/2 Caucasian) will be born in about 4 months and I have already started nesting, crafting, decorating, painting, etc. 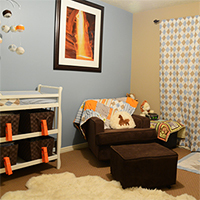 I like to get the nursery and big projects done early because towards the end of my pregnancies I’m very limited physically due to severe Pelvic Girdle Pain (often misdiagnosed as Sciatica). 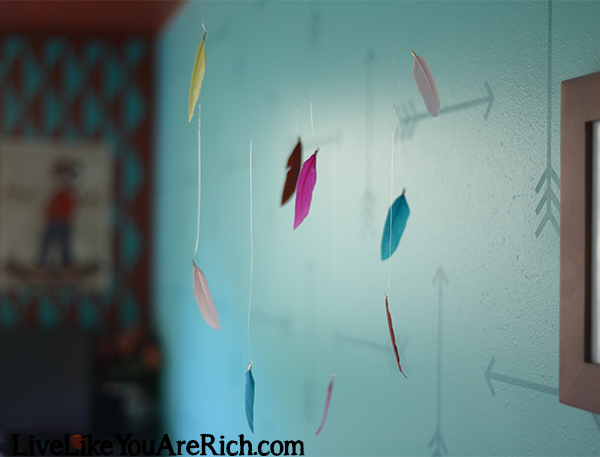 So one of the craft projects I created was making this easy, inexpensive, and cute feather mobile. It is hung over her baby changing station. It only took 20 or so minutes to make and cost me $7.00. If you are interested, here’s how to make one yourself. First, gather the feathers. I was at Forever 21 and they were having a sale on earrings. 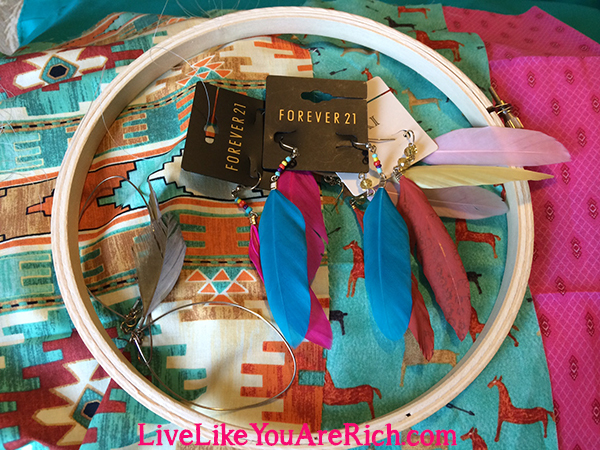 I got 4 pair- 9 feathers from earrings they had discounted (yes one was an odd number) for $6.00. Here is a nice pack of 12 (6 pair) for about $7.00 on Amazon. Next, get a hoop the size that you’d like. I just bought an embroidery hoop and used just the inside hoop. for about $1.00 at JoAnn’s (after a 30% off coupon). Or you can use this one on Amazon. The one I used was 8″ in diameter. 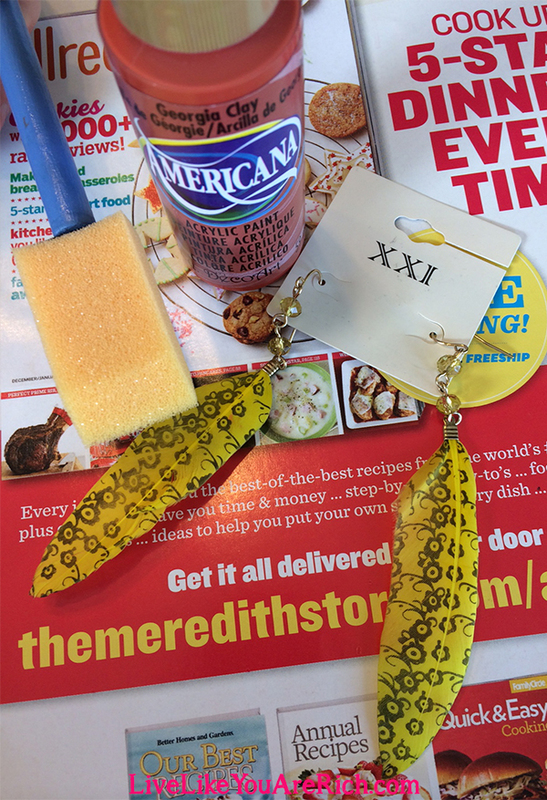 Next, if the feathers aren’t the perfect color, paint them to be the color you want them to be. 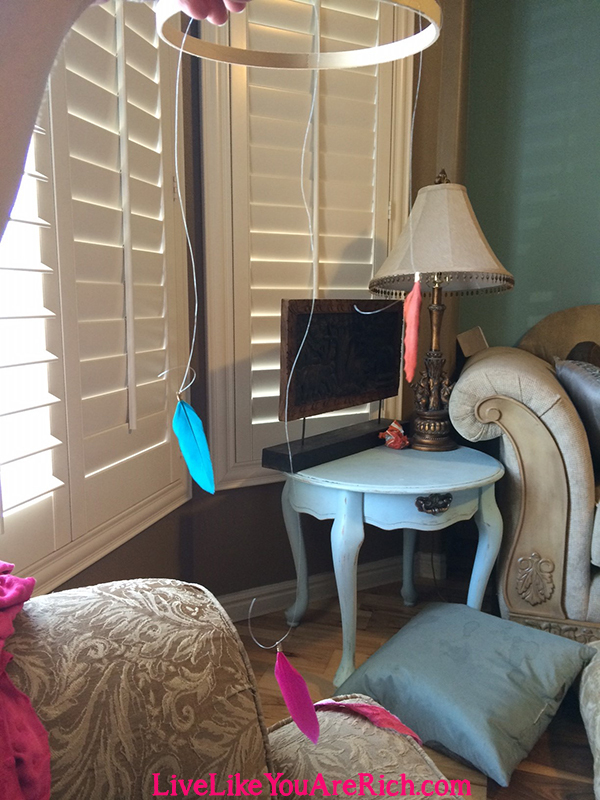 I needed a coral color to go with my colors turquoise, coral, and bright pink so I had to paint one pair of feathers. 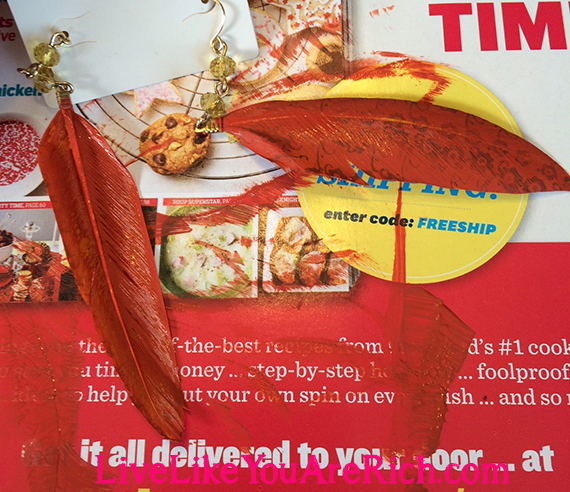 I used this Georgia Clay color paint and painted them (the rest of the feathers were the right colors). I hung them to dry. Note- If possible get the feathers the color you want. Although painting them does work it makes them a little more crusty and a little less feather-like than I would have desired. Next get clear crafting wire or use fishing line. We haven’t been fishing for who knows how long so I just took the amount needed off of one of our poles. I detached the feathers from the earring hook, left the clamp on the feather, and tied a double knot around it with the fishing wire. I then proceeded to tie each feather at a different length. Adding variety will add interest. 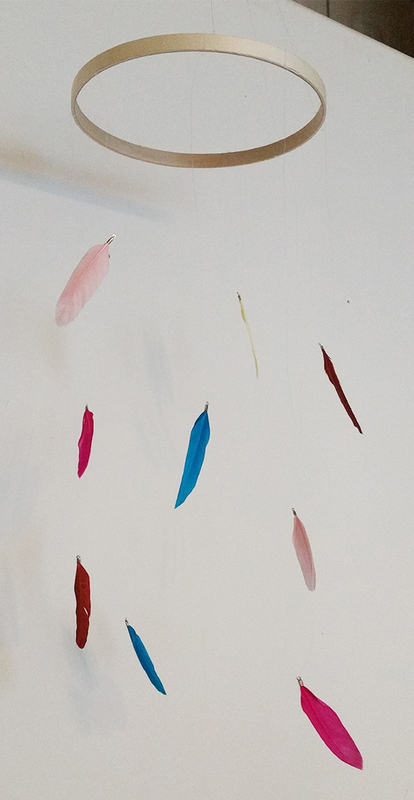 Some feathers I hung low, others high, and some in between. I trimmed off the excess fishing line after I got the desired look. Next, and probably the most difficult part was the top. I tied 6 lengths of fishing wire to the hoop. Making sure to leave plenty of length to reach the ceiling. Then I did my best to make it level. You can adjust the level once the wire is attached by moving that knot around the hoop to different areas. Once I felt that it was level I tied a knot in the string about 7 inches from the wood hoop (so it would stay level). I didn’t trim the line after tying the not because I used the remaining line to hang the mobile from the ceiling. To hang it, I got a screw and screwed it where I wanted my mobile to hang into the ceiling (just 1/2 way). Then I tied a knot or two with the fishing line around the screw and while holding it there I tightened the screw all the way into the ceiling. The screw, the knots around the screw, and the pressure from the ceiling holds the mobile in place. 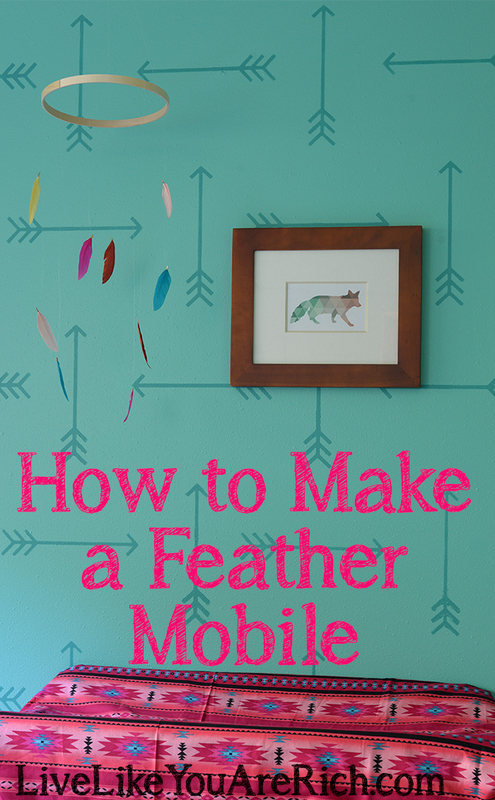 If you need to make adjustments on the level of the mobile, just move the fishing line around a little on the hoop. This should get it about right. I have more tutorials on the modern Native American/Navajo Nursery I made for our soon-to-be daughter in the next few weeks. So please click here. For other ‘rich living’ and DIY tutorials, please subscribe, like me on Facebook, and follow me on Pinterest.